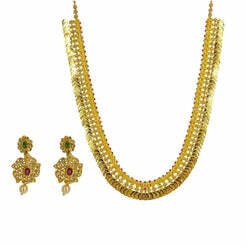 22K Antique Gold Charm Necklac & Drop Earrings Set W/ Ruby, Emerald, and Kundan Stones for women. 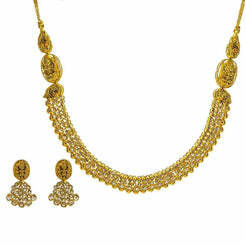 Gold beaded necklace with hadcrafted laxmi and floral charms. 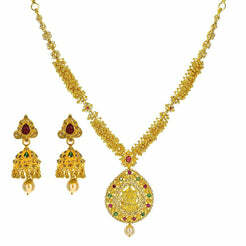 Emerald, Ruby & Kundan details set delicately on the necklace. Earring post stem thickness is 1mm. Gold weight is 93.4. Special occasion necklace.